Ashley Colburn is a two-time Emmy award winning television producer and host. 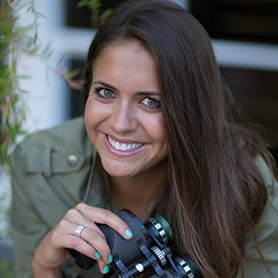 Ashley specializes in producing and hosting travel documentaries highlighting the wonder in the world. Whether she is bungee jumping in New Zealand or climbing the Matterhorn in Switzerland, there isn’t much she won’t do! She has filmed in more than 40 countries over the past 9 years for her TV shows, Takeoff with Ashley Colburn and WONDERS, however even when she is not filming she is still traveling and has been to 60 countries! In addition to jet setting worldwide, Ashley and her team develop innovative ways of promoting countries through tours, congresses, and provide consulting services to those developing in the tourism industry. Ashley is also the host to several online web series for GOGO Vacations, Liberty Travel, Sail Croatia and more! She is actively making video guides which you can also find on her YouTube channel! Thanks for stopping by and happy traveling!